While filing your income tax return (ITR) for assessment year (AY) 2018-19, the deadline for which is 31 July, don’t just look at the Form 16 you get from your employer even if you are a salaried individual. Make sure you disclose gains or losses made from selling shares or redeeming mutual fund (MF) units, or selling a property or jewellery. Irrespective of the amount gained or lost, one must disclose capital gains or losses while filing ITR. 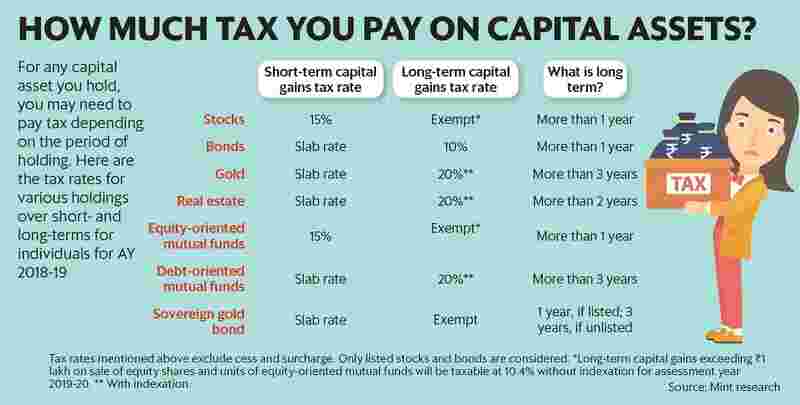 Here is how you can calculate capital gains from different assets and how to disclose them while filing ITR. Profits or gains arising from transfer of a capital asset such as property, gold, shares and bonds are considered capital gains and taxed under the income head “capital gains". Such gains are of two types—short-term and long-term—depending on the period of holding. Capital gains are calculated by deducting the cost of acquiring the asset from its sale value. But the rules are different for different assets. Real estate: Gains made from transfer of immovable property (land, house, apartment) within two years of purchase are considered short-term capital gains (STCG); after two years, they become long-term capital gains (LTCG). The LTCG rate is 20% with indexation, while STCG is taxed at the slab rate. To calculate LTCG, first calculate the indexed cost of acquisition “by multiplying the cost of acquisition with the notified cost inflation index (CII) for the year of sale and dividing this by CII of the year of purchase," said Sandeep Sehgal, director-tax and regulatory, Ashok Maheshwary & Associates LLP, a chartered accountancy firm. But if the asset was bought before 2001, then you need to use the fair market value (FMV) as on 1 April 2001 and then calculate the indexed cost of acquisition. For instance, if the property was bought in 1995, you need to calculate the property’s FMV as on 1 April 2001 and then arrive at the cost of acquisition. Read more on how to calculate FMV and indexed cost of acquisition at here and here. The rules are different for inherited or gifted property. Here, the “cost of acquisition incurred by the previous owner and his or her period of holding is considered to compute gains," said Sehgal. Any expense necessary at the time of the asset’s acquisition or transfer can be added to the indexed cost of acquisition. For instance, stamp duty, registration fee, brokerage charges and legal fees. However, you can avoid paying LTCG tax on property transfer or reduce the tax implication to some extent by reinvesting the capital gains into a residential property or specified infrastructure bonds, within a specified time period. Shares and mutual funds: Gains from transfer of shares and equity oriented mutual funds within a year of purchase are considered STCG; after a year, they are considered LTCG. For the current AY 2018-19, STCG tax for such assets is 15%. Whereas LTCG from equity is exempt from tax. But from next AY i.e. 2019-20, LTCG will be taxed. Because, the Finance Act, 2018 withdrew the exemption granted under Section 10(38). A new section, 112A, was introduced with effect from 1 April 2018. “It provides that LTCG from equity exceeding ₹ 1 lakh per year shall be taxable at the rate of 10% (plus applicable surcharge and cess) without any indexation benefit," said Taranpreet Singh, partner, TASS Advisors, a chartered accountancy firm. There is also a provision of grandfathering. In case of short-term capital loss (STCL), it can be set off against other STCG. It can also be carried forward to subsequent financial years for set-off. Long-term capital loss (LTCL) are not allowed to be set off or carried forward. Expenses incurred in transacting shares or equity mutual fund units can be claimed for deduction when calculating capital gains. For debt-oriented funds, both holding period and tax implications are different. Gains made from selling debt-oriented fund units within 36 months of holding are considered STCG and taxed at the slab rate. “Sale of debt-oriented fund units shall trigger LTCG tax when the holding period is more than 36 months. The rate of tax is 20% (plus applicable surcharge and cess) with indexation benefit," said Singh. Gold and bonds: “Jewellery or bullion are chargeable to capital gains tax, irrespective of the method of acquisition—self-purchased, gifted or inherited," said Sehgal. If sold before three years from the date of purchase, gains are considered STCG, else LTCG. STCG from sale of gold is taxed at the slab rate, and LTCG at 20% with indexation. There are different rules for bonds depending on the issuer and other features. For instance, listed corporate bonds are considered short term if sold before one year from the date of purchase. STCG is taxed at slab rate. If such bonds are sold after a year, the gains are considered LTCG and taxed at the rate of 10% without indexation. Apart from these, specified tax-free bonds (listed or unlisted) are covered under Section 10(15) of the Income Tax Act and are exempt from tax. Once you have figured out what your capital gains or losses are, the next step is to include them in your ITR form. There are different ITR forms based on the type and amount of income. “Individuals with income from salary and capital gains are required to fill ITR-2," said Singh. This AY 2018-19, you are required to put the details and break-up of each income in your return, including capital gains. “The requirements regarding capital gains in ITR-2 are extensive and depend upon the type of asset sold and period of holding, whether it is a long-term capital asset or a short-term capital asset. Generally, the details to be disclosed are the date of sale and purchase, purchase amount, sales consideration, type of asset, transfer expenses and so on. If the capital asset is a security, you need to furnish additional information like whether STT is paid or not, whether it’s listed or unlisted," said Sehgal. Apart from that, expenses claimed while calculating capital gains should also be mentioned clearly. For instance, “brokerage and other expenses in connection to transfer to compute the capital gain, also need to be mentioned," said Singh. Even if capital gains earned are tax-exempt, they need to be disclosed in the return. There is a separate space in the ITR to mention details of exempt incomes. “It is also advisable to disclose all kinds of exempt income, including exempt capital gains. Such exempt incomes are to be disclosed in Schedule EI," said Sehgal. Over the years, the tax department has become vigilant and tracks all transactions and compares them with the return filed by an individual. Misreporting or under-reporting income can be traced, and may result in penalty and fine. If you have transacted in capital assets or have any other type of income which you are unsure of how and where to disclose, take the help of chartered accountants or tax return preparers to help file your ITR.